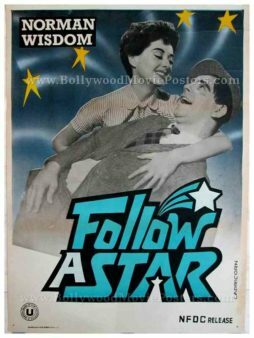 Old movie poster of the memorable Hollywood film, Follow a Star (1959), for sale. This is an actual surviving vintage black and white movie poster of the 1959 comedy starring Norman Wisdom. Printed and circulated in India somewhere in the 1970s/1980s during the release of the film by The National Film Development Corporation of India (NFDC), this poster was originally intended for publicity of the film but never ended up being used. Follow a Star is a 1959 British comedy film directed by Robert Asher and starring Norman Wisdom, June Laverick & Jerry Desmonde. The story is rather similar to the ending of Singin’ in the Rain, where a singer fraudulently “borrows” the voice of Norman Wisdom’s character. This poster was circulated during the National Film Development Corporation of India’s (NFDC) release of the film in India.